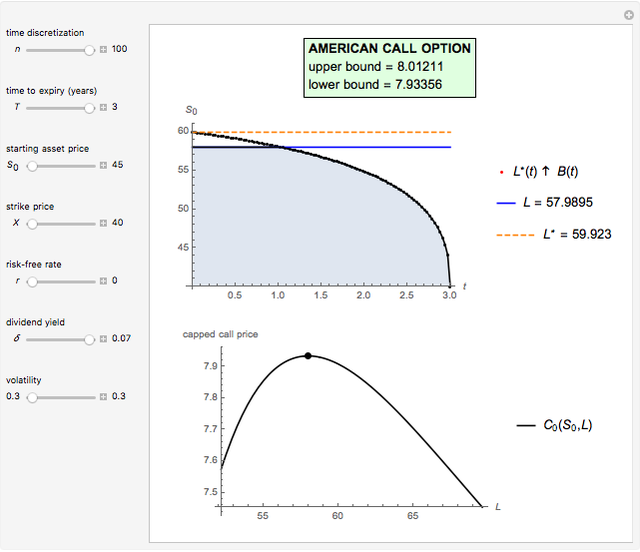 This Demonstration shows the maximization process of an American capped call option with a constant cap (or barrier). Because the capped call must be instantly exercised if the underlying asset price rises above a predetermined price , which is called the "cap" or "cap price", its value never exceeds the value of the standard American call. Thus, identifying the cap that maximizes the capped call payoff function , we obtain a lower bound for the American call price. Moreover, the evaluation of the capped call payoff function derivative with respect to the cap, while the underlying asset price approaches the cap from below, provides a lower approach for the American call optimal exercise boundary . Finally, after replacing with in Kim's integral equation , an upper bound for the American call price is obtained. Thus the capped call option is really a tool used to bracket the pricing of the commonly traded American option. The table shows the upper and lower bounds for the theoretical American call price. Simpson's rule is applied to approximate Kim's integral, so increasing the time discretization gives a more accurate (tighter) upper bound. The upper graph shows the cap (blue line) that maximizes the capped call price, the function (red dots) that approaches the optimal exercise boundary , and the optimal exercise boundary approach at (orange dashed line). For the capped call's holder, the early exercise is not optimal while the asset price moves in the blue area. 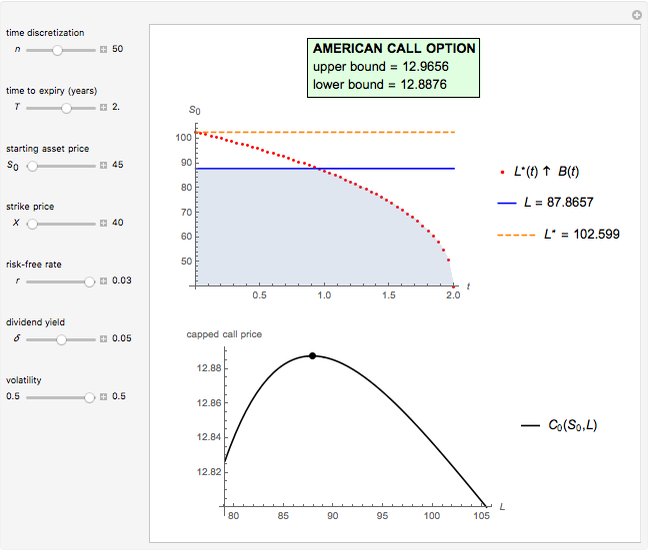 The lower graph shows the cap price (black dot) that maximizes the payoff function of the capped call at . 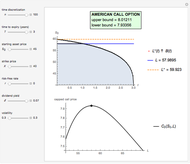 The black curve represents the payoff function of the American capped call, depending on the cap price at . Lastly, this Demonstration does not use Mathematica's built-in function FinancialDerivative which may be applied on a variety of financial instruments, including several types of barrier and capped power options. 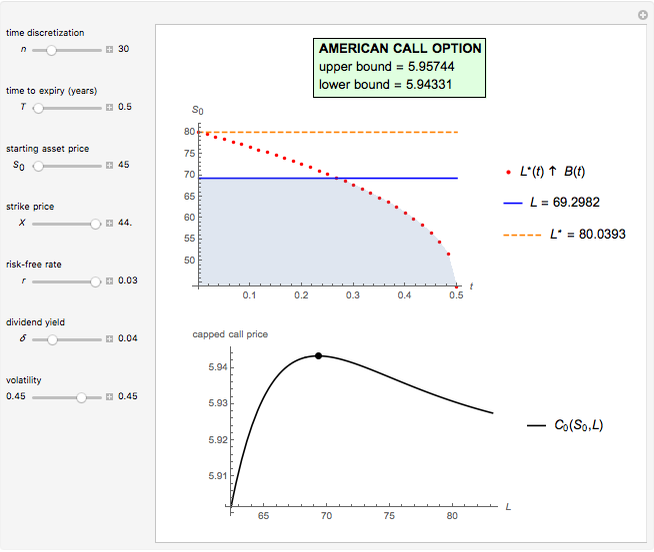 M. Broadie and J. Detemple  developed an analytical formula to estimate American capped call options. In order to approximate an American call payoff , they use the value of a capped call written on the same asset . If the price of the underlying asset is , when the payoff of a capped call option is , where is the strike price and is the cap. The payoff is the same as a standard American option, except that the cap limits the maximum possible payoff. Since the policy of exercising when the asset price reaches the constant cap is an admissible policy for the American option, for any . The determination of is a simple univariate differentiable optimization problem for any given . In this Demonstration, Mathematica's built-in function NMaximize is applied. The evaluation of the capped call payoff function derivative with respect to the cap, while the underlying asset price approaches the cap from below, leads to an exercise boundary , where is the American call optimal early exercise boundary at time . The boundary is the solution to the equation , where . In this Demonstration, the Newton–Raphson technique is applied to solve . 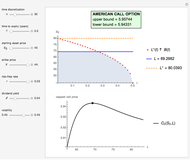 Moreover, M. Broadie and J. Detemple  prove that an upper bound for the American call price is obtained, after replacing the optimal early exercise boundary function with in Kim's integral equation . The integral in Kim's equation represents the early exercise premium and is approximated by Simpson's rule. I. J. Kim, &OpenCurlyDoubleQuote;The Analytic Valuation of American Options,&CloseCurlyDoubleQuote; The Review of Financial Studies, 3(4), 1990 pp. 547–572. M. Broadie and J. Detemple, "American Capped Call Options on Dividend Paying Assets," The Review of Financial Studies, 8(1), 1995 pp. 161–191. Michail Bozoudis "American Capped Call Options with Constant Cap"